This blog started off as educational news on vehicle emissions in Europe, but it has turned into a bit of a rant. However, I am going to share my findings with you anyway! 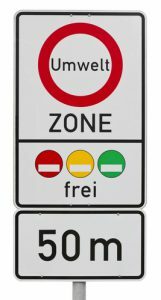 In a bid to improve air quality in assorted “sensitive” areas across Europe (including cities and other places where either people, nature or historic buildings need protecting from heavy traffic pollution), many EU countries have introduced Low Emission Zones (LEZs). I thought I’d do some research on LEZs to help you understand the rules for France and her neighbouring countries. But to be perfectly frank, it has been like trying to understand the workings of the Large Hadron Collider, with a view to making one in my shed! More than 200 cities in 10 European countries are now operating LEZs. Is there one common EU scheme that we can all readily understand and comply with? Of course not! Some ban older vehicles, some make charges for some types of vehicle, some prohibit certain vehicles on certain days and some want you to show a sticker. The only thing that they have in common is that they all have a different approach! The scheme in France is pretty simple: you register the vehicle, pay and then display a sticker in your windscreen, if you plan to visit certain cities (at the moment just Paris, Grenoble and Lyon). As the France Motorhome Hire fleet is made up of 2016 or 2017 vehicles, they have the latest low-emission engines, so you can take them anywhere in France. 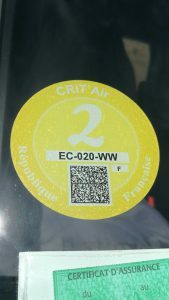 We have already purchased the French LEZ windscreen stickers (pictured left), so anybody hiring from us can travel freely in France. So far the only other country we have received clear advice from is Germany. 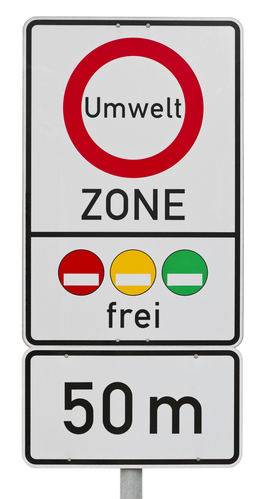 The Department for Transport have sent us the following links which explain the scheme and how you can comply – in a nutshell, you have to get the sticker to enter certain cities. The good news is that you can buy the sticker in 5,600 places once you get to Germany, so it looks pretty easy to comply with. Here’s a link to the full, tedious and unabridged details in a Baden-Württemberg Ministry of Transport brochure (opens in new window). In other EU countries, most of the Low Emission Zones only affect vans and lorries, but some also affect cars and campervans. The good old Automobile Association in the UK have valiantly attempted to explain how the LEZs are applied in European countries on this web page. It is very comprehensive with other links to add detail, but you’d probably be able to figure out how to build the Collider in less time than it takes to work out what you actually have to do! We will add a web page to our site, with a summary of the rules in each country, as we manage to get confirmation from the assorted governments. In the meantime, our advice is to check the rules before you head out of France for any countries you plan to visit – the AA web page is a good starting point.